As well as not blogging recently I've not been taking many photos. Well nothing specifically arty anyway, I do of course have a few zillion of my kids etc sitting on my phone and camera. I have therefore been going through what I have taken to try and find something suitably blog worthy. I like this one. I think I took it about a week before Christmas in a garden centre cafe. I think garden centres are such a brilliant place to visit at Christmas time. They are so festive and usually there is a Santa's Grotto or a few Christmas activities for the kids. This picture could have been set out better but it's not bad for a quick snapshot. 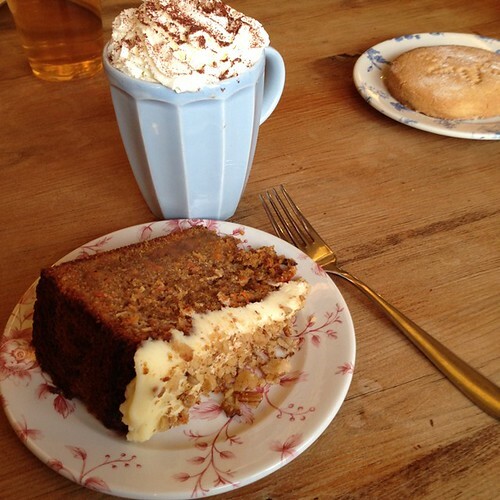 And this carrot cake was delicious but huge! I'm not sure if I was even able to finish it which for me is saying something. I shall get taking new photos soon!